Following the large member turnout at the last school board meeting, the parties explored whether meeting sooner rather than later might be advantageous to all parties. The parties reconvened negotiations this afternoon. At 4:30 this afternoon the parties reached a tentative agreement. · Science Camp Stipend and History Day Stipend at $1,151,54 each. · Increased yearly pay for certification and licensure Speech and Language Pathologist from $3,500 to $4,000/yr. · We extended evaluation time from every 3 to 5 years for teachers with 10 years of service or more. · We added a new step 25, increasing the current maximum amount from $92,119 to $93,642 (not including the across the board increase). After the across the board increase, this will move our top step to over $95,000. Updated salary schedules will be made available prior to the ratification vote. · Parties have agreed to a 2.5% on schedule increase, retro to July 1, 2018. Thank you for your continued support and dedication. We couldn’t have achieved this without you. SGTA Site Reps will share new contract language at respective sites. Time will be given to members for questions and answers. Thank you all for waiting for a complete update. We met with the district negotiation team on Wednesday 10/17. We talked solely about salary. We expressed our view that our offer is fair and reasonable. We also talked about the Superintendent and Assistant Superintendent raises. We also asked what exactly a Deputy Assistant Superintendent is and what makes it different from the others. The answer we heard was that this person is responsible for taking over if the Superintendent is absent. We also asked why this is different than what we have been doing before since the contracts are so much higher than the others. No real answer was given. As we move toward our goals, there are a few things to keep in mind. We are only as strong as the people and amount of people who support us. We had a great showing at the last board meeting. Thanks for showing up. The last board meeting had about 17% of members in attendance and it was impressive. They are expecting us tomorrow and we need to ramp up the percentage. We need to show the district and the board that we are serious. There are three presentations tomorrow. 1. Student CAASP results, 2. Single Plans for Student Achievement and 3. Interim Budget Revisions. These are all issues that affect us directly. Please answer the questions that were sent out by your site reps so that we can use that information in an address to the board. Take a look at the CAASP presentation. Look at what they are attributing to the rise in scores! We need to be heard and the survey is one way for us to do that. Great job Jefferson, you are giving us your input! Gabrielino- lets make this happen, we are the school with the largest amount of unit members! FYI- If you haven’t taken the time to read the most current Superintendent contracts, not only did they get a raise they also are getting a 0.5 match from the district to their 403b plans along with the other perks that are actually monetary based. June 2017 B. The Superintendent shall annually receive a doctoral stipend in the amount of Two Thousand Dollars ($2,000.00). The Superintendent shall have the right each year to convert up to ten (10) earned but unused vacation days to compensation at the Superintendent’s then current per diem rate of pay. B. The Superintendent shall be provided all fringe benefits provided to other management employees at District expense. Further, in addition to any life insurance policy provided to other certificated management employees, the Superintendent shall receive a term life insurance policy with a premium approximating, but not to exceed, One Thousand Dollars ($1,000.00) per annual period covered by said policy . D. Cell Phone. The District shall provide the Superintendent with a cellular telephone and a tablet device with cellular service through the term of this Agreement at District expense. E. Automobile. In lieu of any other reimbursement for automobile expense incurred in the conduct of his duties on behalf of the District for travel wholly within Los Angeles County and adjacent counties, the District shall provide the Superintendent an allowance of Five Hundred Dollars ($500.00) per month to defray the Superintendent’s actual costs of employment-related automobile travel. The use of this allowance shall be at the Superintendent’s discretion and shall not require any documentation. This monthly allowance shall be treated and considered as part of the Superintendent’s compensation/salary for tax purposes and for purposes of the California Public Employees’ Retirement System (CalPERS) to the maximum extent permitted by law. F. Business Expenses. In lieu of any other reimbursement for business expenses incurred in the conduct of his duties on behalf of the District, the Superintendent shall receive a monthly allowance of Five Hundred Dollars ($500.00). The use of this allowance shall be at the Superintendent’s discretion and shall not require any documentation. This monthly allowance shall be treated and considered as part of the Superintendent’s compensation/salary for tax purposes and for purposes of the CalPERS to the maximum extent permitted by law. Yolanda Mendoza, one year contract effective July 1, 2018 through June 30, 2019 as Deputy Superintendent, Educational Services. Base salary is contracted at $175,000 annually, a hard cap of $7,680 annually for health and welfare benefits, $300 monthly mileage stipend, and $150,000 term life insurance policy. Deferred Compensation Match The District shall provide a 50% match (District will provide $1 for every $2 made by Ms. Mendoza) for any regular contributions made to an approved deferred compensation (403(b)) program up to the allowable statutory limits. The term of this Contract may be extended at any time by the mutual agreement of Ms. Mendoza and the District, but at no time may such agreement be for more than three (3) years. Joyce Yeh first amendment to employment contract as Assistant Superintendent, Business Services. The term of the contract is extended to June 30, 2020, and base salary is step 4 of Assistant Superintendent, Business Services salary schedule at $163,815. SECTION A. TERM OF CONTRACT The Board hereby employs Ms. Yeh and Ms. Yeh remains in the position of Assistant Superintendent, Business Services, for the term commencing August 3, 2015 and expiring on June 30, 2017. ​Hello SGTA Members - This is of an urgent matter. Friday afternoon your SGTA Executive Board met until 6:00 p.m. with our Negotiations Chairperson. We prepared a statement to present to the school board on Tuesday evening regarding the stalled negotiations with the school district. Step One: Answer the following questions below and email them to your site rep by Monday morning. Please email these responses to your site reps BY MONDAY at NOON. 1) What Professional Development/Conferences have you attended in the last year? The Negotiations Team will be sending out further instructions on Monday morning. And don't forget to WEAR BLACK ON TUESDAY!!! Our negotiations team met the with the district today with salary as the main focus. Negotiations has stalled because there was no movement from either party. 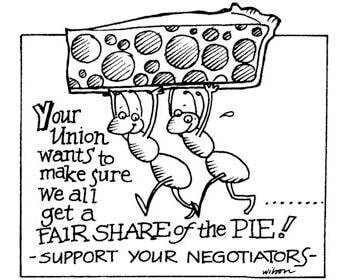 Be prepared to do your part and show up at the next board meeting on Tuesday, October 23rd, your Negotiations Team is expecting your support! More detailed information will be released in the next few days. Let's show we are unified! We started the day talking about Inclusion and EL issues and how each level is determining the model that is being used. We also voiced concerns that teachers are having in their classrooms. The remainder of the day was spent discussing salary. The district proposed several options that essentially equate to the same 2% offer as before. Our team has remained firm at 3% with a salary restructure. We ended the day with no agreements and will continue October 17. A Memorandum of Understanding regarding stipends for Science Camp and Del Mar History Day was signed to allow for stipends to be paid this year. We stand firm that our offer is fair and reasonable. It is important that unit members remain united in our efforts to resolve negotiations and reach a fair settlement. We ask that unit members continue to be present at board meetings to show our solidarity. The next board meeting is this Tuesday, October 9. This is the only board meeting between now and October 17, our next negotiations meeting with the district. Members from all sites are encouraged strongly to attend. 4:00 p.m: Attend the gathering at Shakey's Pizza Parlor to hear the latest negotiations updates and strategies! Make your presence known at the S.G.U.S.D. School Board Meeting! ​It's time for us to get a slice of the Pie! On October 4th your negotiations team will continue the next round of negotiating. Take a look below at our graphics... No matter which way you slice it, its time for us to get a piece of the pie! Although the percentages are not equal, we are seeking to move closer to parity with regards to the percentages. We are asking for 3% because we feel that this will bring us closer and we feel that this is fair and appropriate with regards to declining enrollment. So please wear your shirts on October 4th! Your SGTA Negotiations team believes we ALL deserve a slice! Director Yolanda Mendoza 2018 Base Salary: $175,000. Ross Perry 2018 Base Salary: $149,915. Today was our second full session of negotiations and was productive. We completed negotiations at 3:30 p.m. We started our day with a presentation from Joyce Yeh regarding the district’s Unaudited Actuals. As time passed and proposals were passed, we realized that a 2-year contract for salary increase was holding things up. To move the process along, we are exploring a 1-year salary increase on schedule with the options to reopen for 2019-2020. Our last proposal was for 3% on schedule. The district has increased from 1% for 2018 to a 2%. Our proposal of 3% was given to the district at the end of the session. Our next meeting will be October 4th. We look forward to hearing what the district’s counter proposal will be. Based on the district financials and the importance of prioritizing our members in the classroom, we maintain that this is a fair and reasonable offer. ﻿Agenda Item: 7.d. PRESENTATION - A presentation on the 2017-2018 Unaudited Actuals will be given by Vanessa Eastland, Director of Fiscal Services. Show that we are unified! 4:00 p.m: Attend the gathering at Shakey's Pizza Parlor to hear the latest negotiationsupdate! Negotiations team meet with the district’s new team which is composed of Ross Perry, Brian Murray, Ruth Esseln, Matt Arnold, Jim Symonds and Joyce Yeh. We started the day with norm since we have a new district team. We asked for the unaudited actuals. We were informed that the unaudited actuals would be available when the board agenda is posted for the September 11 meeting. At that board meeting, the board members will certify the report. We asked for current enrollment. The Day 8 projections show that we are still down by 146 students compared to last year. We had conversations with the district team regarding the need for language on inclusion and co-teaching. The conversation was very collaborative, and we gained a lot of insight on special education regulations. We will continue conversations with the district at our next meeting. At our last negotiations meeting on June 1, 2018, we sent a counter proposal to the district proposal of 1% on schedule increase for 2018-19. Our counter proposal was 3.75% on schedule July 1, 2018 and 2.75% on schedule July 1, 2019. Salary schedule restructure addressing the step freeze between steps 13-19. In the afternoon, the district countered with 1% July 1, 2018 and 1% on schedule July 1, 2019. The district proposal prior to today was only a 1-year proposal. The new proposal opens the contract up to a 2-year contract. Upon salary analysis of district level administration, the average raise between 4 employees is over 20%, over the span of 2013-2018 whereas SGTA, during the same time frame has a total of 10%. We ended the day at 2:30 with an SGTA counter proposal for 3.5% July 1, 2018 on schedule and 2.5% July 1, 2019 on schedule. We are scheduled to meet again on September 10, 2018. To show the district that we are united, be sure to attend the next board meeting and wear your SGTA shirts on September 10. Look for the next negotiations update on Sangabrielteachers.com, our SGTA website, under the bargaining link. Wear your SGTA shirts on Monday, September 10 to support our team! Attend the Shakeys gathering on Tuesday, September 11th at 4:00 p.m. to rally! Attend the Board Meeting on September 11th to show we are united! On Thursday, Sept 7th, SGTA responded to the districts salary proposal from last June. The district responded with a counter proposal as well. We then returned with another counter proposal. No action was taken and the session was ended due to a principals meeting that was previously scheduled. Negotiations will continue this Thursday, Sept. 14th. Please wear your SGTA Shirts to work on Thursday Sep 14th to support our team! ​Hooray! We have a final contract proposal to look at and vote on (pending approval by SGTA exec board today and SGTA site reps tomorrow). Chanda and I would like to present it to you on FRIDAY at noon in Chanda's room, B201. If we can get started right at noon, it will only take about 15 minutes and you can resume your department plans for the afternoon. We will also be voting on the contract after the presentation. Once all school sites have voted, we will 'sunshine' our proposal to the board. The negotiations committee is glad to announce that we have signed a tentative agreement. The next steps include: 1.) meeting with the exec board on Monday for approval, 2.) Meeting with the Rep Council on Tuesday. Informational meetings and membership voting will follow. Keep your eyes open for future times and dates. As of December 2, we met and spent the day on salary discussions. on this matter as well. the meeting wearing their SGTA shirts. actuals and 2014-2015 unaudited actuals. This represents a 15.6% increase in revenues. No progress has been made in the area of salary. We made a counter to the district’s last proposal and are waiting for a response. Our next negotiations meeting is scheduled for December 2, 2015. As of the last meeting on October 20, the district rejected our salary proposal and made a counter proposal. Our proposal attempts to make our salaries more comparable to surrounding districts (see below info). Their offer was FAR below what we are proposing. Additionally, their counter partially funds our increase with the savings from switching our health benefits from Anthem Blue Cross program to Blue Shield. Basically, they want us to fund part of our own salary increase. Our next session is scheduled for November 18. SGTA will continue to push for an across the board salary increase that improves all teachers salaries. Additionally, there are a number of contract language issues that need to be further discussed. Alhambra, Glendora, Arcadia, La Canada, Azusa, Bassett, Bonita, Duarte, El Rancho, Glendora, La Canada, Monrovia, San Marino, South Pasadena, Temple City and West Covina. range from $79,023 to $99,702. 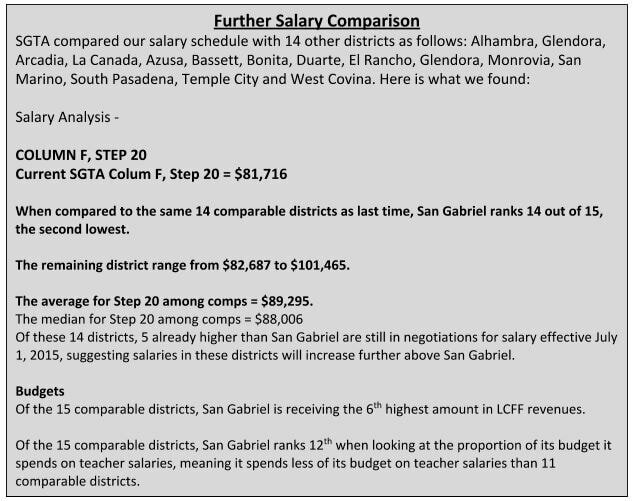 column, Step 1, San Gabriel ranks 15 out of 15, the lowest. in these districts will increase further above San Gabriel. Our next scheduled negotiation meeting is October 6, but may be canceled if the district is unable to come to the table with a new salary offer. Please let me know by Oct 6 if you would like to attend. This is an amazing workshop put on by CTA. If you are planning on retiring, this is a great workshop. There is a strong possibility that our Anthem HMO/PPO plans will be changing to Blue Shield in January. Please let me know ASAP if your current Anthem providers are NOT contracted with Blue Shield (you will have to call and talk to their insurance person to find out for sure). The district says that this change will only minimally effect us at 96% of the current Anthem doctors are contracted with Blue Shield as well. Negotiations does not feel as confident. Also, this year you be required to meet with a district HR rep to sign up digitally. Look out for more information. There is not much exciting happening now, but we would still like to have some teachers in the audience.